In a perfect world, we’d take our pets everywhere we go. Unfortunately, be it work, taking the kids to school or doing the groceries, there’s times when you need to leave your kitty home alone. But just because they don’t have you to play with, doesn’t mean they have to be bored. Here are 10 of the best ways to keep your cat entertained while you’re out of the house. For cats that are more into the hunt than the prize, toys like the SmartCat Peek-A-Prize allow you to stuff a box with plush toys that your cat can then ‘hunt’ by flipping them out of the box through the holes. It engages their natural instincts and can keep them playing for hours. Cats love to play in boxes. 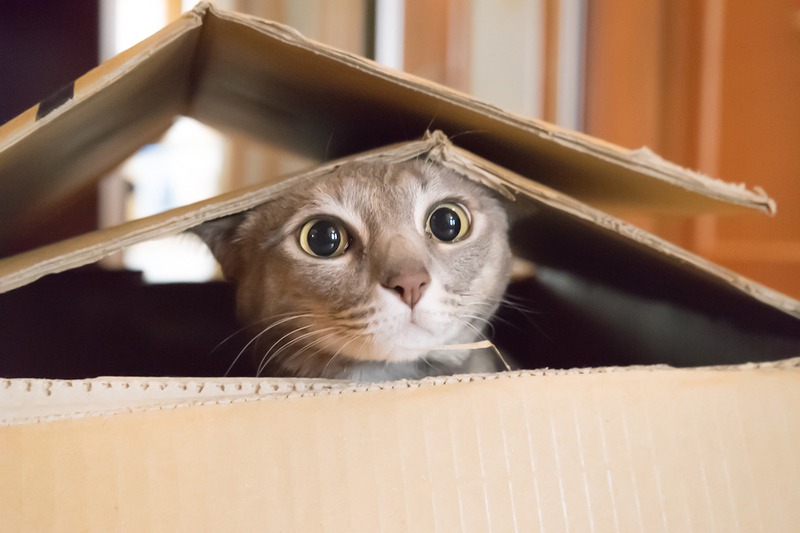 Whether it’s bounding in and out of them, playing hide and seek, using it as a fort, sled or just generally using it as a play toy, the simple cardboard box is a fun, cheap and easily obtainable item to keep your cat engaged and entertained while you are at work. Not only are they easy to come by, they pose little risk to your kitty (and the furniture), and can be easily replaced once your current box is a broken mess. Cat trees include a combination of scratching posts, jungle gym, hidey holes and a host of other features. They come in a variety of configurations and will keep your cat happy and engaged for hours. Check out your local pet store for these. Cats are drawn to the outside world and watching it go by, particularly from an elevated position. If you’ve got a second story with a balcony or floor to ceiling glass, leave the blinds open so your kitty has endless entertainment outside. Alternatively, install a shelf or move a piece of furniture like a bookshelf close to the window so they have a good view while you’re at work. While fish and cats aren’t always the best mix (especially if you’re the fish), a properly secured and out of reach fish tank can keep your cat entertained and visually stimulated while you’re at work. Fish tanks also add to the interior design of your home. Just be 100% sure there’s no way your cat can get into the tank or knock it over. Ever entertained the idea of adopting another cat? A friend for your feline could be the perfect solution to home alone doldrums. Obviously, adopting another cat is a big responsibility, so be sure you’re ready to take it on. Visit your local animal shelter and ask to meet the cats. You’ll know best what sort of disposition will match the kitty you already have. However you decide to keep your cat entertained, a designated ‘play zone’ is important in setting boundaries for where the action happens. This will contain play activities to a specific area, be it a small nook, corner of the house or even just a windowsill. If you want your cat to be able to go outside (while remaining inside) there are small enclosures available for purchase (or do it yourself) that jut out from the window, letting your cat get some fresh air without being in danger. Pet MD recommends making these areas entertaining by placing hanging toys and bells from the top so your cat can bat them around and be engaged in their special play area. From YouTube for Cats to DVDs you can buy especially for your feline friend, television can make great entertainment, especially for older cats who aren’t on the go all the time. Most of these videos show animals like birds and mice running around. Show one to your cat and if they get interested, you know you’re onto a winner. In our digital world, you never have to truly be away from your pet. PetCube have a number of cool products that help you keep an eye on your kitty, play with them remotely and even dispense treats to them while you’re at work. And, if the boss doesn’t like you playing with your cat on company time, just show them how cute your kitty is and they’ll change their tune in no time. Nobody knows your cat like you do. While it might take some experimenting to find the right balance, the tips above should put you on the path to success in keeping your kitty entertained while you’re away from home. Cat furniture is a commodity that is known by many names. The most common include Cat Trees, Cat Condos, Kitty Condos, Cat Towers, Cat Climbers, Cat Scratchers and Cat Gyms. There are dozens more, but whatever term you use to describe cat furniture, the purpose is the same – to enable your cats to follow their instinctual desire to scratch without damaging your furniture, carpet, or other belongings, and also to give them a place of their own where they can exercise, play, and lounge. Nice post… My cat always trying to bite and eat the toys instead of playing with. Do you have any ideas for the best cat toys that cant be chewable? If you have any best toys in your mind that can be gifted for both cat and dog, it would be great as I have both. Can we have an article about treating dog and cat happily without making the other one sad? Hi Jonni, it’s lovely that you are giving a home to a kitten. I hope that your older cat enjoys the company, but if there are issues, consult your vet without delay. I have tried everything. Got a fish tank, my cat doesn’t care about it at all. Tried several different interactive feeding puzzles/toys, he will leave it sit with food in it, doesn’t care to get it out even if I put his beloved treats inside. Bought many different toys, he wont play with any of them, he has three different window seats with scratchers and comfy places to sit/sleep, doesn’t use them. He just follows me around constantly, meowing, swiping at my leg, wanting to play. The only thing he will play with is the feathers on a stick. He refuses to entertain himself so he is constantly needing me and its stressing me out because I am a caretaker of a mother with dementia and when I come home I just feel like there’s another endless need to take care of. He’s also over ten years old and hasn’t been this bad when he was younger. Any suggestions how to make my cat happy without playing with him ten hours a day?